Samsung has a tablet in nearly every size imaginable, including two 10.1-inch devices, so the Galaxy Note 10.1 doesn't appear to fill a niche that hasn't already been filled. Appear is the key word here because, actually, the Galaxy Note 10.1 offers an incredible experience that helps it differentiate itself from every other tablet on the market that I've used. The magic is in the S Pen and the Wacom display. It's not for everyone, but it's reasonably priced and a viable contender to existing tablets. I'll take you a bit deeper in my full review. At first glance the Galaxy Note 10.1 looks like many of the other Galaxy Tab 10.1 devices, but it's actually very different in both build quality and design. The Note 10.1 has beautifully beveled edges, each side has a small speaker, an attractive faux silver border and a gray backside. It's comfortable to hold at just 1.31lbs, although I'm admittedly a fan of smaller 7-inch tablets such as the Nexus 7 that are easier to tote around. If you don't like plastic, you're going to have a bad time. (shout out to Reddit). 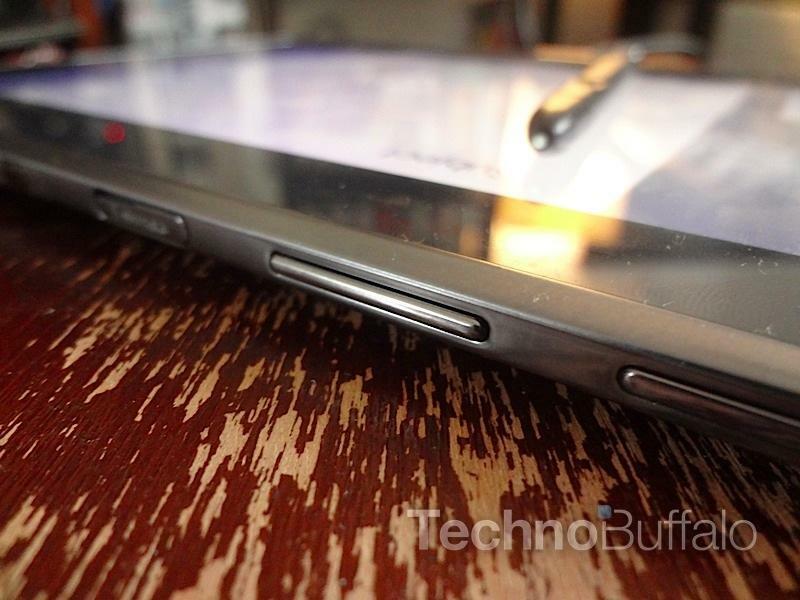 The Galaxy Note 10.1 doesn't feel like the iPad, but that doesn't bother me. I'm not put off by plastic, although it does attract fingerprints, and actually do like the look and feel of the Note 10.1. My biggest gripe is that the screen can get incredibly gunked up with fingerprints, but that's usually the case with most tablets anyway. The speaker grills add a bit of flair to the side of the unit and the music I played sounded decent even at higher volumes. There's plenty of noteworthy hardware under the hood. My unit is equipped with 16GB of storage, but that can be expanded to up to 80GB using a 64GB micro SD card and there's also 50GB of free Dropbox storage for two years. The device is powered by a quad-core Exynos processor clocked at 1.4GHz, has 2GB of RAM and offers support for Wi-Fi, Bluetooth, DLNA connectivity and more. The 1280 x 800-pixel display isn't as sharp as options you would get on tablets such as the ASUS Transformer Pad Infinity, but it is sharp enough and was bright under all lighting conditions. 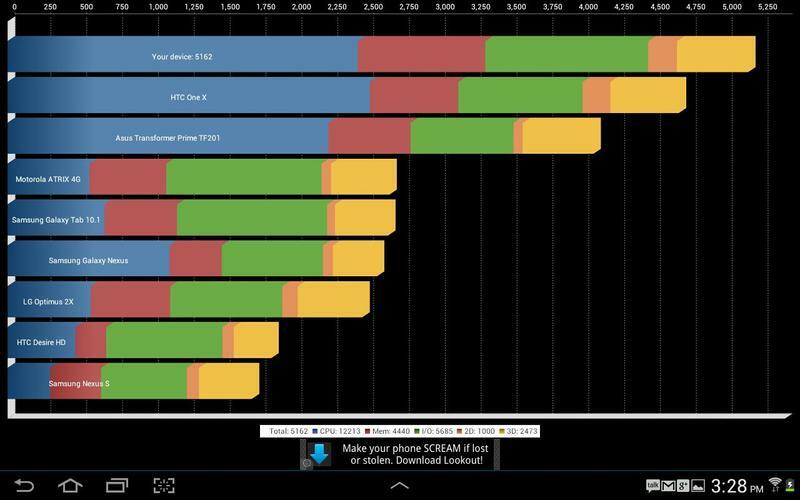 I mention this a bit later in the review but, performance wise, the Galaxy Note 10.1 was smooth. As you'll note from the Quadrant score above, the device appears to be slightly more powerful than the Transformer Prime TF201 in some areas. Generally, though, I imagine most people are buying this tablet for drawing and writing. It performs those tasks without issue. There's plenty of noteworthy hardware under the hood. Since picking up the tablet a few days ago, I've spent a great deal of time lounging around with it in bed and drawing. I haven't really sketched anything since I was a kid, so it was a trip down memory lane drawing some of the same cartoon faces that I sketched in my notebooks back in high school. That's largely thanks to the Wacom display, which uses wireless technology to speak to the S Pen that stores neatly into one of the corners of the tablet. It has 1,024 levels of pressure sensitivity, too, so I was able to sketch light and dark, fat and skinny lines depending on how hard I pressed down on the stylus. 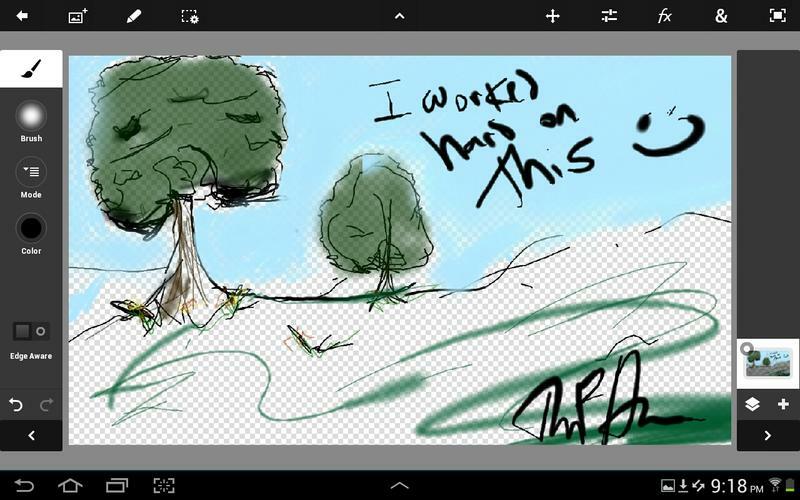 This worked beautifully while drawing a tree (I'm not the best artist) and was particularly useful when I was editing images in Photoshop Touch. 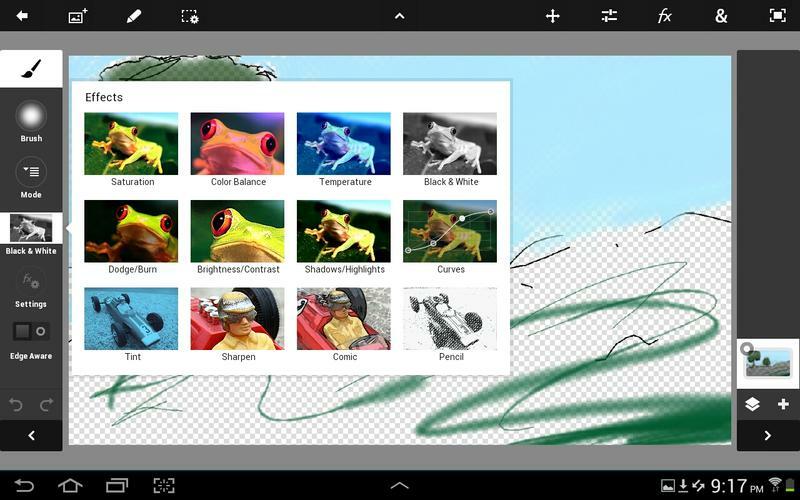 Photoshop Touch is awesome and usually retails for $9.99 from the Google Play app store. However, it's a totally different experience using it with a stylus that supports more than a thousand levels of input. I can use my hand on the Nexus 7, for example, but I loved being able to take a full color image and carefully and accurately change the whole thing to black and white save for a few subjects. TouchWiz has its own quick launch bar at the bottom of the screen for quickly launching the calculator, the music player and other small "widget-style" applications. I liked being able to access this from any application to quickly change songs. 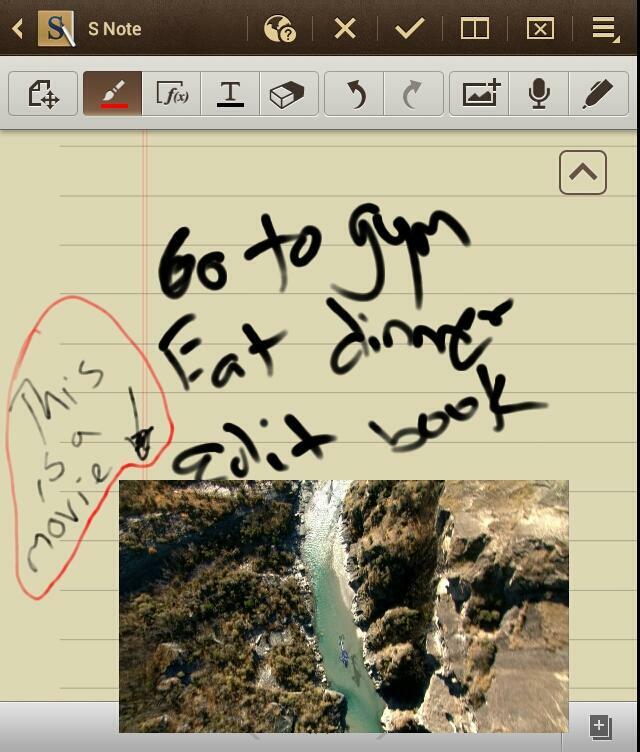 I generally found the user interface to be on the intrusive side, but I did like several parts of S Note. For example, I was able to write out an equation using the software's new function application and search for the solution through Wolphram Alpha. There's also a handwriting-to-text conversion feature that works well, but it won't allow you to easily write full sentences because you have to stop to insert a space after every word. I've seen reports that the interface is sluggish, but I really didn't experience that at all. I was able to easily run video, surf the Web and sketch a drawing without having any problem with stuttering. This is all thanks to the support for multiscreen, which allows you to run two applications side by side. You can see an example of this in Jon's video above. My big issue, however, is that you can't run just any application in side-by-side mode. Instead, you're limited to the video player, S Pen, the web browser and a few others. Samsung says it's working with developers to allow them to add-in support for side-by-side presentation. So, technically, one day you'll be able to take notes in class while playing Words with Friends. Maybe, anyway. GroupShare and GroupCast are two unique applications that are also available on the Galaxy Note 10.1. GroupShare is an excellent feature for using the tablet's camera to share photos with other GroupShare-enabled devices, such as the Galaxy S III or other tablets. It works really well if you're on the same network, but I don't ever find myself wanting to use it. GroupCast is an excellent tool I think enterprise users and education systems can really take advantage of. It's an extension of the DLNA-enabled AllShare Play application that allows everyone to see what's happening on a primary screen at once. So, for example, a presenter could have a slideshow up on a big Samsung TV and everyone with a GroupCast device, such as the Galaxy S III or the Galaxy Note 10.1, can follow along with the presentation. Each user can add notes or interact with the main display, too, so it has the potential to really enable amazing brainstorming sessions. Again, the only catch is that everyone needs to have this device to take advantage of it. But I imagine that a school system could really get the most out of it. 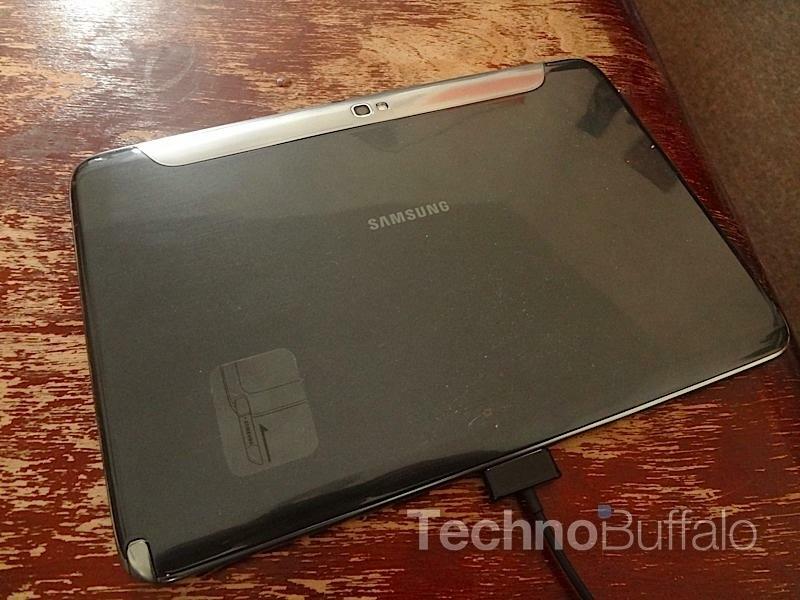 Samsung equipped the Galaxy Note 10.1 with an IR blaster and an application called Peel that, together, can be used to change the channels on, and control, a television. It's neat in theory, but it didn't work well for me. While the IR blaster had no issue controlling my TV, the Peel software presented the wrong content for every channel. I don't use cable and instead rely on an over-the-air service, so that could be my problem, but it does offer OTA guides as an option so it should have worked. Finally, and this is a small issue, but Samsung includes its S Suggest application suggestion guide on the tablet and it's absolutely not formatted for viewing on a tablet. 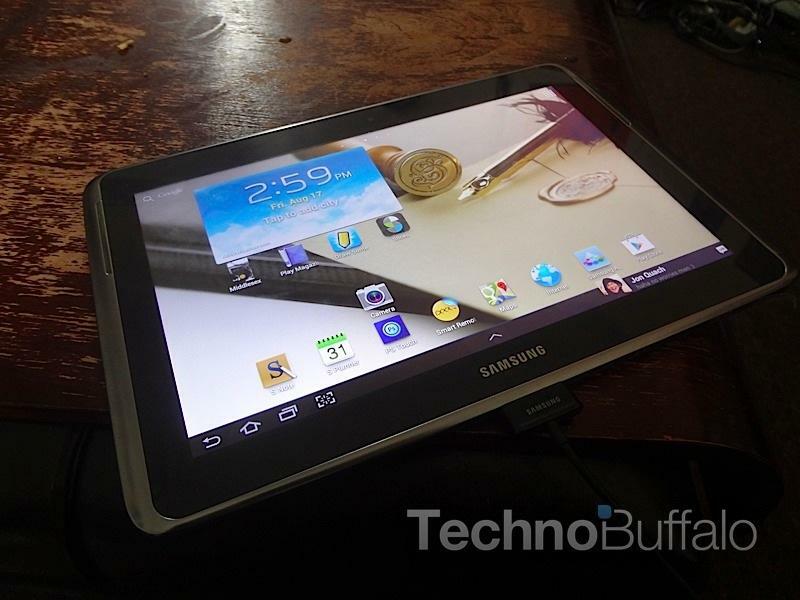 It just gives me the wrong rub, as if Samsung slapped the app on the Galaxy Note 10.1 and called it a day. I love my Nexus 7, not only due to its size but because it runs Android 4.1 Jelly Bean. 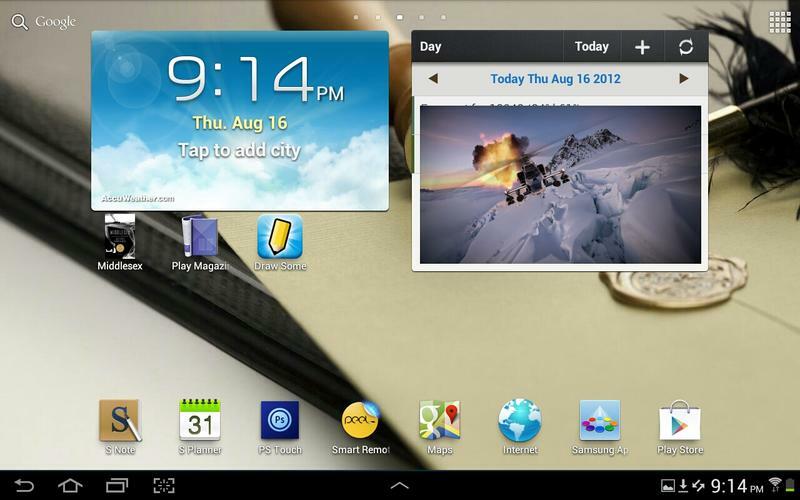 Samsung's Note 10.1 runs Android 4.0 Ice Cream Sandwich, but that's not my only beef with it. 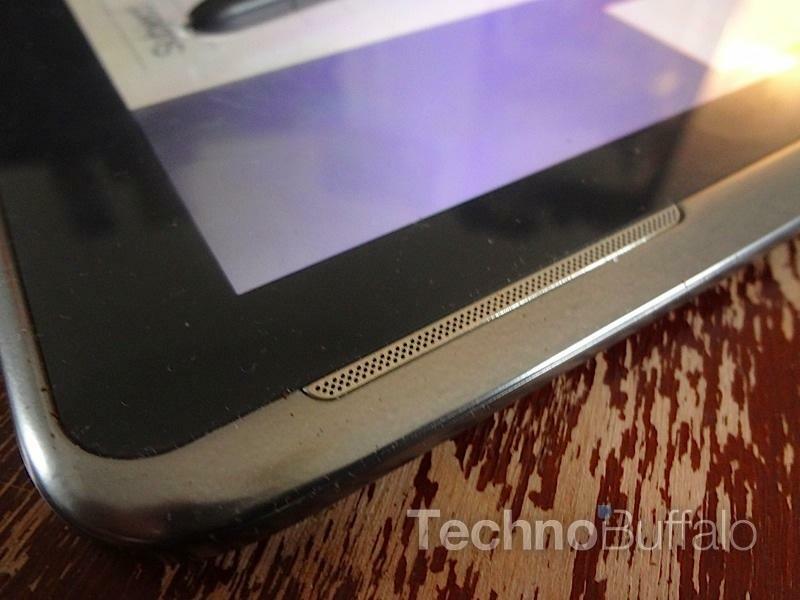 The company added its own TouchWiz user interface that's very similar to its Nature UX on the Galaxy S III. I like that it caters to all of the functions you can do with the S Pen and that it puts S Note and Photoshop Touch front and center, but it feels too overweight to me. The widgets and Samsung-built applications have an ugly khaki/brown color to them and some of the apps aren't very intuitive to use. There's a diary S Pen template, for example, that includes a mood and the weather at the top of each entry. But I have no idea how to change the mood or the weather, or if it's even possible. There are other flaws, too. If you run the S Note software side-by-side with the browser and want to take an image, you can't simply drag and drop it over. You can copy it, but then you have to insert it by selecting the "insert image icon" and choosing the clipboard as the source. Why not just allow for easy copy/paste? 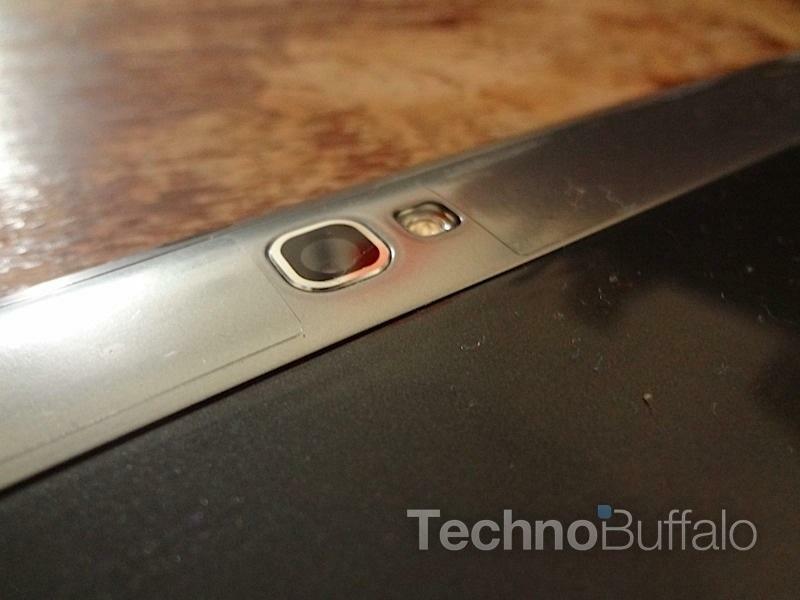 Look, don't buy the Galaxy Note 10.1 for its camera. It's not very good. 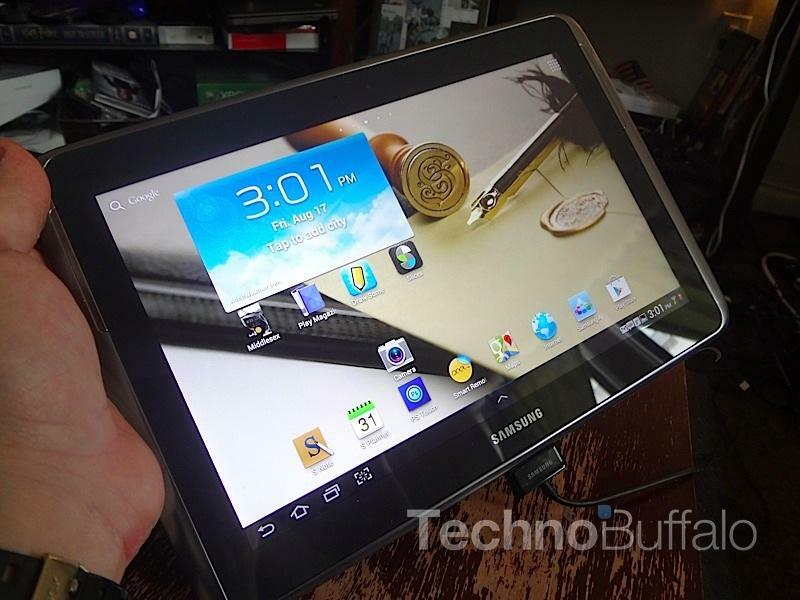 Just like every other Samsung tablet it's zoomed in super far by default and I'm not sure why. You can't change this, either, otherwise it wouldn't be an issue. The images can technically be used for editing in Photoshop Touch or for including notes, but I honestly was never impressed with enough of them to actually want to do that. The front-facing camera was OK during a brief video chat – it did its purpose, and I used it to share a silly picture of myself with my friends – but again, the quality from the Galaxy S III and nearly any other camera I've used is better. There's a video editor app on the Galaxy Note 10.1 that's very light in its functionality, so much so that it's not really worth writing about. The video recordings were, again, nothing exciting and I didn't find them worth sharing with anyone. 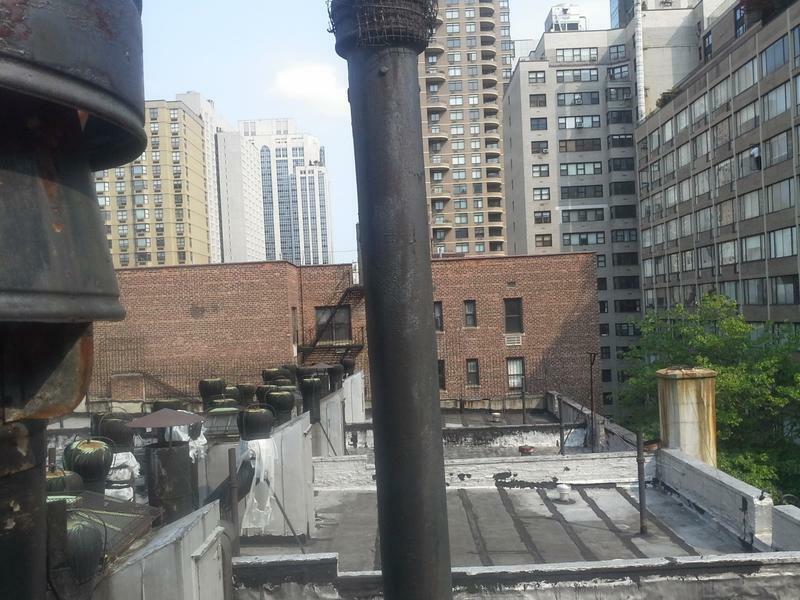 Use a point and shoot or your smartphone. Google and ASUS said it best when the two firms launched the Nexus 7: if you can't include a decent camera, don't include one at all. It's not for everyone, but it's not made to be either. This isn't the tablet to replace an iPad. It's not supposed to go up against the Nexus 7. It doesn't really need to compete with the ASUS Infinity Prime. Why? None of those tablets have a Wacom display and an S Pen. The iPad might be great for the general population, and there are plenty of stylus accessories available for it, but the Galaxy Note 10.1 is a winner in its own right. Grab a cup of coffee, call on your muses and sit down with the Galaxy Note 10.1 and be creative. The world needs more people like you.